. : Optics & Photonics Focus :: Colors Beyond the Noise :. Check out my blood! Ex vivo stimulated emission image of microcapillaries of a mouse ear based on endogenous hemoglobin contrast (in red color), showing individual blood cells in the vessel network (inset) surrounding sebaceous glands (green overlay based on confocal reflectance). Image courtesy: Wei Min and Sijia Lu of Harvard University. Listen to your favorite melody in the middle of a busy road junction at rush hour. The notes will probably sound confused and distorted amongst all the voices of the people walking home from work, the rumble of car engines, and the sound of blaring horns. This scenario is pretty similar to what happens in many research labs everyday, where scientists, like passionate music fans, try to detect feeble signals amidst all the undesirable background noise. 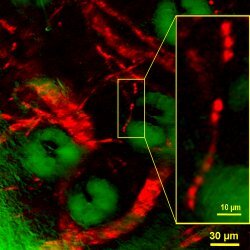 This is certainly true for Sunney Xiaoliang Xie and his research group at Harvard University (Cambridge, Massachusetts, USA), who developed a new technique for optical microscopy which enables imaging of molecules whose fluorescence is normally overwhelmed by background noise. "Fluorescence has been one of the dominant contrast mechanisms for optical microscopy," explains Xie. Contrast is the difference in visual properties that makes an object distinguishable from other objects and the background. The colorful world around us, as seen through our eyes, is primarily due to absorption contrast. The white light impinging on a material surface contains all colors, but only some of them are absorbed by the material. We can, therefore, see only the remaining colors. "Under an optical microscope, however," Xie adds, "absorption contrast is not the method of choice for visualization for two reasons: first, absorption is too weak to measure because of the small number of molecules in a microscopic sample; second, light scattering complicates the absorption signal as both effects result in light attenuation." What is fluorescence? Fluorescence is an optical property of some substances whose molecules spontaneously emit visible light after absorbing light of a shorter wavelength: for example, they could absorb green light to emit red light after. "Many important molecules, such as hemoglobin, cytochrome, melanin and retinal," Xie points out, "absorb light but have undetectable fluorescence, yet their absorption is too weak to be detected under a normal microscope." These signals are normally overwhelmed by many other background signals, such as stray light, solvent Raman scattering, and detector dark counts. Fluorescent labeling, therefore, has been one of the main solutions to this lack in detection: a fluorophore is a molecule covalently attached to the molecules that one wants to detect, thus providing a strong source of fluorescence to be detected under the optical microscope. Live cell imaging. An image of live E. coli cells, which contain cytoplasmic non-fluorescent chromoproteins by stimulated emission microscopy. In the inset, a transmission image of the same cells is shown for comparison. Image courtesy: Wei Min and Sijia Lu of Harvard University. Now, the work carried out at Harvard University, where Wei Min and Sijia Lu were two of the main contributors, proposes a brand new contrast method for the imaging of molecules that absorb, but do not fluoresce. To do so they adopt the use of stimulated emission of photons. "Stimulated emission," Xie explains, "is a phenomenon that was first described by Albert Einstein in 1917 and was the basis for working LASERs, but had not been used as a contrast mechanism for optical imaging." Molecules can emit light in a process called stimulated emission: when a molecule is brought to an excited state by absorption of a photon with the correct energy, its following de-excitation back to the ground state leads to the release of a new photon, identical in frequency to the photon of excitation. By periodically triggering the stimulated emission of photons, the researchers at Harvard University were, as an example, able to map the distribution of non-fluorescent cytoplasmic proteins in live bacteria against the laser background. Many are the predicted applications for such a technique, especially in biomedical imaging. 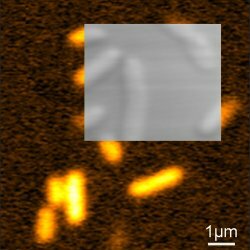 Such a technique, as Xie confirms, "allows spectroscopic identification of molecules in living organisms and is free from the complication of light scattering by the sample. This opens many new possibilities for biomedical imaging, such as label free mapping of drug distributions and blood vessels in tissues." Nevertheless, biological applications do not exhaust the range of applications this technique could be useful for. As Tianquan Lian at Emory University (Georgia, USA) points out, "this technique may find many applications outside the biological arena. One potential application is, for example, in studying electron transfer or other ultrafast dynamics in nanomaterials, in which both time and spatial resolutions are needed. Understanding of these processes is essential to many applications, including solar cells. These processes quench the fluorescence and, therefore, make them difficult to study using fluorescence spectroscopy. They can now be studied with this new technique." Wei Min, Sijia Lu, Shasha Chong, Rahul Roy, Gary R. Holtom & X. Sunney Xie, Imaging chromophores with undetectable fluorescence by stimulated emission microscopy, Nature (2009) 461, 1105-1109 (link).